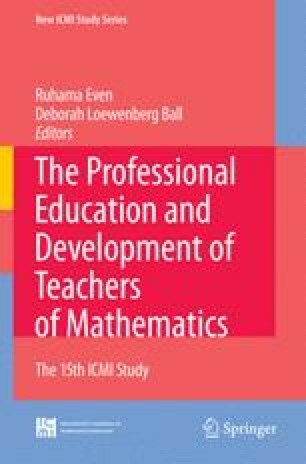 Teacher education programmes at tertiary educational institutions traditionally comprise three key strands–disciplinary studies, educational studies, and teaching practice (Comiti & Ball, 1996). The aim of these strands is to develop an integrated competence in student teachers and is often referred to as teacher knowledge. Winsløw and Durrand-Guerrier (2007) name the respective target knowledge components as content knowledge, pedagogical knowledge, and didactical knowledge, noting that each component “may occur with different emphases on theory and practice” (p. 7) and are viewed, in terms of weight and organisation, differently within different cultural traditions.